Testosterone is one of the most important hormones in the male body, and low levels can cause serious and life-disrupting symptoms. 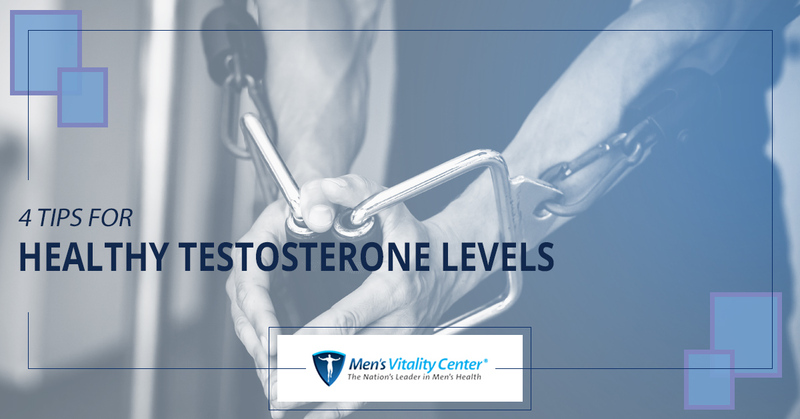 In today’s post, we’ll provide you with four tips that will help you keep your testosterone levels healthy in the months and years to come. While these tips are certainly good advice for most men, some men will need to supplement their efforts with testosterone replacement therapy to feel their best. If you would like to learn more about hormone replacement therapy, then give us a call at 480-588-2430 or fill out the form at the bottom of this page to get started. We look forward to speaking with you soon. Regular exercise is one of the best ways to feel better and prevent a number of negative diseases, and it’s also a great way to keep your testosterone levels high. While getting exercise of any kind will boost your mood and help your body stay healthy, certain kinds of exercise are more likely to raise your testosterone levels than others. High-intensity interval training and lifting weights are two of the most effective ways to raise testosterone levels through exercise, but nearly any form of exercise will increase testosterone to some extent. Speak with your doctor or a member of our men’s health center before beginning a new exercise regimen. Our schedules are busier than ever before, and our bodies are suffering the consequences. High stress levels increase the body’s production of cortisol, the fight-or-flight hormone, in response to stressful situations. While this hormone helped our ancestors protect themselves from the very real threats of the ancient world, the demands of contemporary society often lead to consistently elevated cortisol levels. 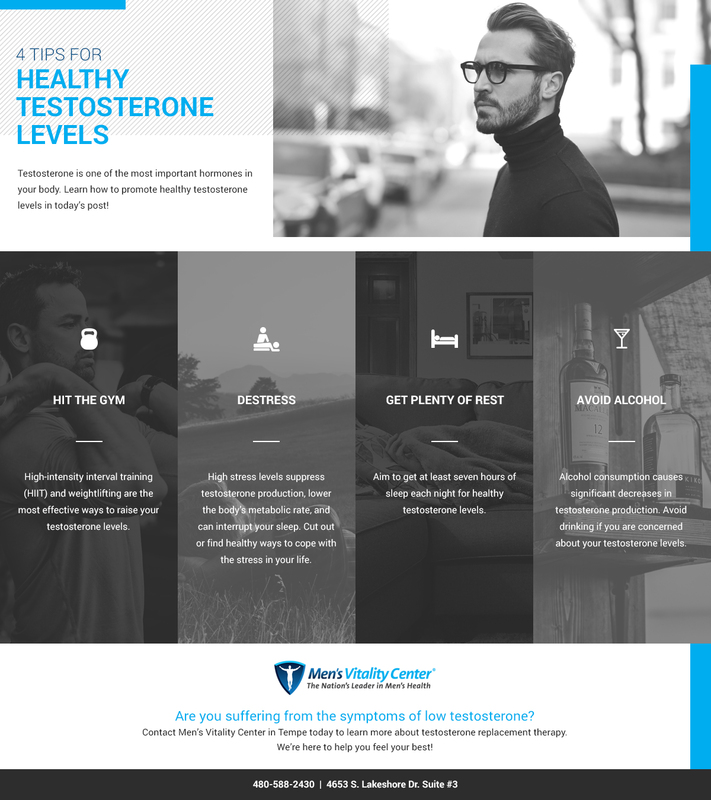 Cortisol suppresses testosterone production, lowers the body’s metabolic rate, and can interrupt your sleep, so speak with a member of our men’s health center about effective ways to reduce the stress in your life. Cutting out unnecessary stress is particularly important if you’re currently or planning to begin testosterone replacement therapy. A good night’s sleep is one of the best gifts you can give your body. You’ll feel alert, energetic, ready to take on the day, and your testosterone levels will be higher. While your body produces some testosterone throughout the day, the majority of testosterone production occurs during sleep. Aim to get at least seven hours of sleep each night for healthy testosterone levels. Alcohol consumption, especially in high quantities, leads to significant decreases in testosterone production. The body prioritizes alcohol metabolization before almost anything else, so while your liver is processing alcohol, your body isn’t producing testosterone. If you suspect that your testosterone levels are low, or if you are planning to begin testosterone replacement therapy, then try to moderate your drinking and cut back as much as possible. Keep an eye on our blog page for future posts in which we’ll continue to provide you with information about how to keep your testosterone levels high. If you would like to learn more about testosterone replacement therapy in Tempe, then get in touch with us to schedule an appointment today!